Even the most stubborn man's heart will melt when he finds the woman who completes him. For Kaleb, that was Timminy. Every time they interacted it was just so obvious that they were head over heels for one another. Their love was so genuine and so authentic! 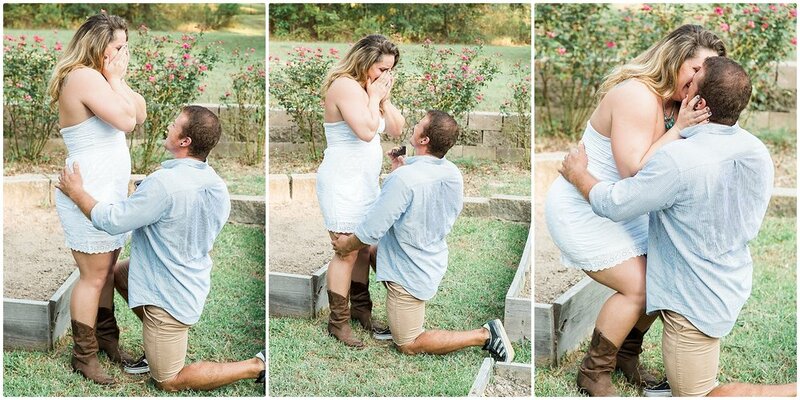 And so the time came when Kaleb decided it was time to propose. After many hours of planning the decision was made that we would set up a family photo session on Kaleb's family's property while everyone was visiting from out of town. Each family had their turn in front of the camera and then, last but not least, we wandered over to the center of the garden where Kaleb and Timminy were going to take the last round of photos together... or so she thought. His words were perfect and she returned his affection. ...and through joy-filled tears she said "yes" and sealed it with a kiss. And all the onlooking family, who had so anxiously awaited this moment, celebrated with the newly engaged couple! It was a truely beautiful day! I can't wait to celebrate their wedding day with them this May!